We weren’t supposed to bring anything heavy on the race. This was a serious racing program. But I did; a good camera with extra lenses and film, in case something big happened. It probably wasn’t a great idea to take my beloved and fragile 35mm SLR on a deck awash in waves, pelting rain and spray. But I did, just long enough to snap two images: one of the dad at the helm, daughter at his side, with the rest of the stunned-crazy crew lining the rail, and another of the son on the bow looking like a water-logged superhero mid-battle. The camera was never the same after the drenching, but the two images are, for me, iconic and real as now. 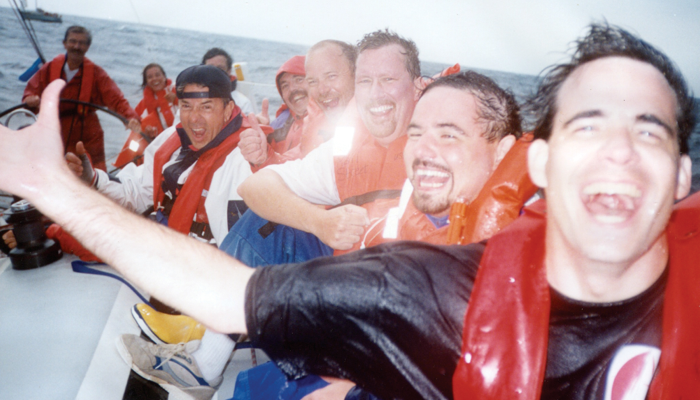 I remember the moment exactly as photographed; a vivid and fond sailing memory. 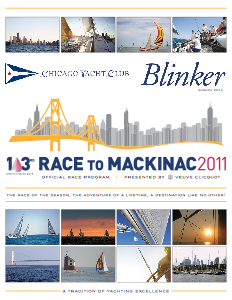 The summer had been unbearably hot, super-heating the land and Lake Michigan by the start of the Race to Mackinac. A couple of low pressure systems met somewhere north of Denver and marched across the hot plains, gathering more energy when they collided with the warm lake. The massive front smashed the mid-lake fleet, packing an initial seventy knot wallop of wind, bigger than the classic summer squall by a factor of two and enough to frighten even seasoned offshore sailboat racers. The blast ripped sails, broke booms, parted sheets and forced sailboats to run. We had dropped and lashed our headsail, but were neither fast nor impressed enough to reef the mainsail. Perhaps we should’ve been. We were forced to ease fast and run for the Michigan shore barely in control. The rig bucked and twisted like a long bamboo fishing pole, crushing the chocks and then pounding back and forth at the partners sounding like cannons. I was sure the rig would come down. It didn’t. Instead, the boat shuddered and charged ahead at almost twenty knots, speeds not yet seen by its crew. Soaked to the bone in cotton tees but feeling record speeds, the crew saw the camera and burst into wide grins and loud shouts. It was as if the old fragile Minolta had broken the ice — shifting the focus from the terror of gale-force winds and the ominous banging in the rig to the ecstasy of the surf and the warm freshwater spray. What was scary and uncomfortable was now a joyride. The party only lasted a couple of minutes. The storm was roiling tall and square breakers from the north by northwest. We might be able to harden up to a northeast course, but only if we could find the power to get through the big waves. Sixty-five knots gradually fell to fifty-five and then to forty-five but held firm. What felt like a train out of control began to feel like a heavyweight boxer taking and giving hits. Still a very big breeze, but a bit more manageable. ￼ Snap photo number two. 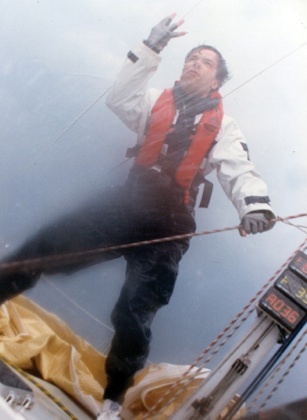 A wave burst over the bow and hit him like a fire hose while I took the photograph. I dried off my camera and bagged it and joined the team on the bow to raise a sail. To be frank, I don’t recall much else about this specific race. The rest of it runs together with the many others we did together. But I remember that we squirted ahead with our newfound power and ability to point with the number four and never gave up a wide lead. We finished with a flag and our highest overall score in many years. More than 60 boats didn’t finish the race at all. The storm had taken them out. Years passed. The Minolta was soon obsolete. The photos lay pinched, fading and forgotten in an album that would include images of my own children’s birthdays a few years later, and then all of their growing up and sailing adventures. Friends went other ways. Enter Facebook twenty years later. Erin, the smiling teenager year old daughter near dad in photo number one, now grown, married, educated and employed at Sailing Magazine, found copies of the prints, scanned them and posted them to her Facebook page. Within a winter weekend, most of the crew was connected again. It gave us reason to reflect on the immensity of the experience caught in the photos. It seemed that we all knew something special was happening when that squall hit. It was bigger and darker then most. And it seemed like we were living on the razor’s edge when the boat lifted up and surfed for a time. It was faster then ever before. And it seemed like we were going to like the added sail area that son Bill suggested. It was smarter and bolder than many others. In hindsight, there are some grander lessons in these two images. To have been in this place, at this time, with a mom, dad, son and daughter, was to have witnessed something truly special and rare. Jean, the mom (not seen in the pictures because she was clearing cockpit lines) was stoic and calm but just as thrilled to be a part of it as anyone else. Daughter, Erin, was giddy like a school-girl but just as tough and eager as the men and boys. Bill, the son, was relentless in his pursuit of the prize, and because of him, we got one. And Bill Sr., the Dad and skipper, kept us all safe with his skillful driving and calm approach and he patiently allowed a camera on deck because he understood how important this moment might be. He was right. The Schanen Family of Port Washington, Wisconsin never isn’t in the Mac race on their lovely boat Mainstreet. It’s been that way now for decades. They taught me, and dozens of other sailing friends, that families can and should share big adventures like this. Two summers ago I re-joined Mainstreet for the race, along with my brother, and we earned another flag. Another family affair flag. More great memories. But this time, without the super-heated squall or the old Minolta 35mm SLR. This time, we took pictures with our iPhones and posted to Facebook en route. You are currently reading Family Sailing Photos at Saving Sailing.